Has your brand seen positive returns on Instagram? Is your Instagram following big enough to drive profitable traffic to your landing pages? If you’re hesitating to answer, it might be time to learn how to get followers on Instagram. The larger your audience grows, the more opportunities you have to engage with users and create unique experiences for them. But sometimes brands take the easy way out when trying to get more Instagram followers. Pay for likes and follower sites are everywhere, but we’ll be the first to tell you organically building an audience will drive much better results. Did you know that roughly 48 million Instagram users are fake? This means no matter how many Instagram followers you have, if they’re fake, they’re not going to your landing page, referring others to your site or making a single purchase. When you’re trying to get more Instagram followers, one of the most important steps is to have your account fully optimized. Think of your brand’s Instagram bio as the “homepage” to your account. Without a bio, image captions, a proper username or profile image, how will people know the account belongs to your brand? It might seem silly, but many companies don’t fill out their bios or use a link to a landing page. This is your one spot to drive Instagram traffic to your site, so optimizing your account is essential. 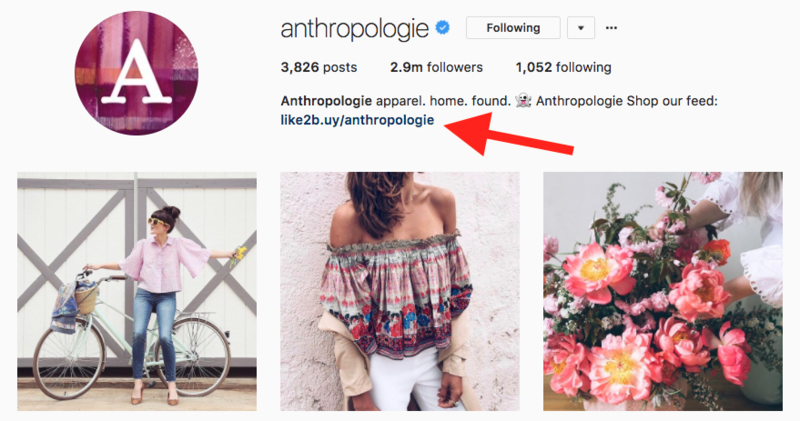 If you’re uncertain where to link, try marketing or product pages that relate to specific keywords, hashtags or campaigns on your Instagram account. Linking to your homepage is OK–but why not give users a cohesive experience when moving from your bio to a site? Additionally, keep your username as search-friendly as possible. If your business name is longer, shorten it to something your audience would recognize. Don’t add numbers or special characters to your username. The worst thing you can do to get more Instagram followers is to irregularly post content. If you’re lucky enough to get users following you in the beginning, the last thing you want to do is make them forget they followed you in the first place. To combat this, keep to a regular posting schedule. Typically, brands shouldn’t post more than a few times a day, but whatever your cadence, keep it consistent. Approximately 200 million Instagram users log on daily, so to cast your net even wider, try publishing a few times throughout the entire day. In fact, our very own research on the best times to post to Instagram recommended Wednesday at 3 p.m., Thursday at 5 a.m., 11 a.m., and 3 to 4 p.m. and Friday at 5 a.m.
Sticking to a schedule will help you build a consistent experience for your followers and keep them in the know of your brand. But if you’re wondering how you’re going to remember to publish at these different times in the day, we’ve got you covered. While the Instagram algorithm has changed to show users more content they like, posting at the right times can still give your posts more visibility. 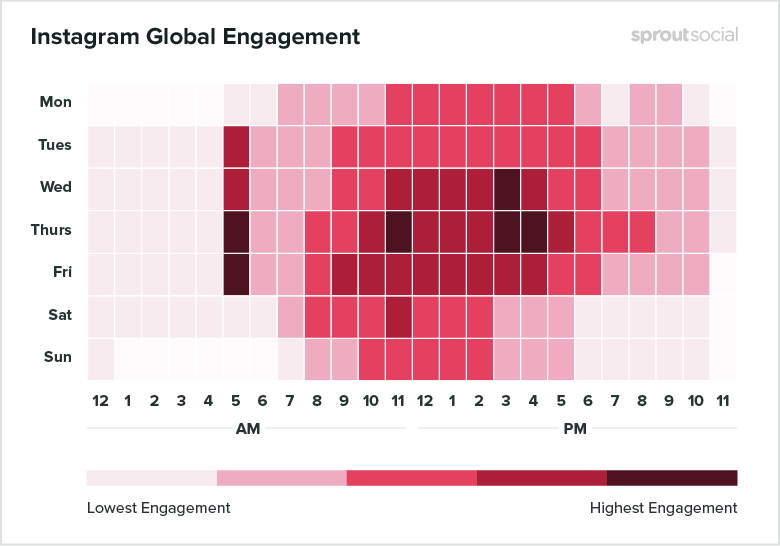 There’s a lot your brand can do, and now with Sprout Social, scheduling Instagram content is one of them. 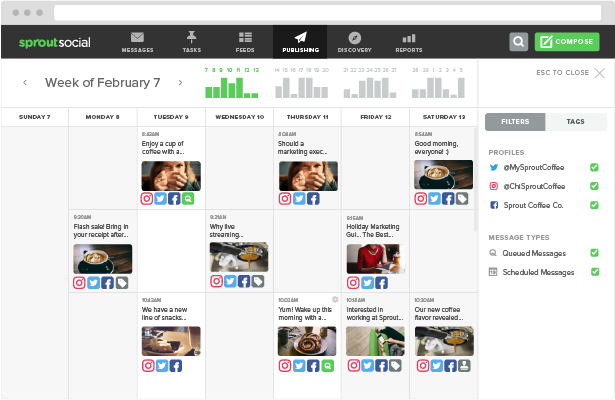 With our newest tools, we can help your brand schedule content through an easy process. By scheduling content in advance, your entire team can see campaigns and schedules more efficiently. It’s always smart to build out content in advance and with our Instagram scheduling tools, you can reach your audience and maintain a consistent flow of content at the same time. When you’re learning how to get followers on Instagram, it’s important to know the value of your audience. The larger your follower count grows (organically), the more buyers and interested customers you will have. The best way to get customers to follow you is to get in front of them and be present. It’s critical to be present on your own Instagram as well as others. Try sponsoring user-generated content to get your brand in customers’ feeds. You can also hold Instagram contests to get your brand out to a larger audience. Another way is to get your handle in front of a much larger audience. Try to work with larger Instagram accounts in your industry to share your content to their audience. And it doesn’t have to be only on Instagram. Just make sure you’re providing something of value. The last thing you want to do is seem too salesy. Find marketing collaborations and co-marketing plans with other businesses to build your Instagram audience. There’s always the possibility your Twitter has more followers than another brand, which you could leverage, trade mentions or share content. There’s a huge difference between an Instagram account having fake and legitimate followers. It might seem tempting to simply purchase Instagram followers, but the backlash outweighs the perks of organic follower growth. Deceive new followers: If users come to an inactive Instagram feed with tens of thousands of followers, things feel deceiving. Don’t trick people into following you. Build trust and long-lasting relationships for better engagement. Have no ROI: It might seem easier to buy followers, but your acquired bot or unmanned new followers won’t be purchasing anything. People follow brands on Instagram for a reason–they like what you’re posting or your company in general. These are actual spenders and bring monetary value to your business. Create little-to-no buzz: If you have 10,000 fake followers, how many are going to comment, like and share your content? More than likely, these bot or fake accounts will be cleaned up by Instagram, deleted and make your posts seem like engagement graveyards. Real people have the ability to share, like, comment and engage with your Instagram posts. Additionally, these users enjoy when there’s someone on the other side responding. 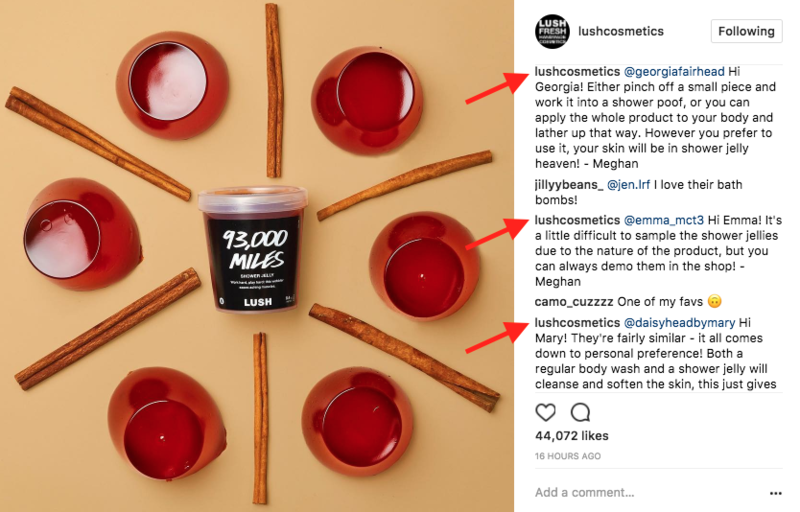 For example, Lush Cosmetics takes the time to answer various product questions, which results in users coming back, following or possibly sharing with others. These interactions will always have more value than a set of inactive followers. How are people going to find an account unless you promote your Instagram? Make sure your Instagram account is listed with your website and other social networks. Creating visibility and awareness is one of the best ways to get discovered. If you truly want to get more Instagram followers, let people know where to find you. You could add social media buttons to your website and blog to help promote social shares across all your networks as well as show people where to find you on Instagram. Another great idea is to cross promote across your social media accounts. The Museum of Modern Art regularly spreads awareness about its Instagram through Twitter. You can easily leverage your other social networks to direct users to your Instagram. However, make sure that you’re not just asking for a follow. Instead you should try to promote unique content on your Instagram so users have a reason to follow you there. Luckily with Instagram video, you have a great opportunity to build followers through creative content. One of the best ways to make users aware of your Instagram is through conversation. 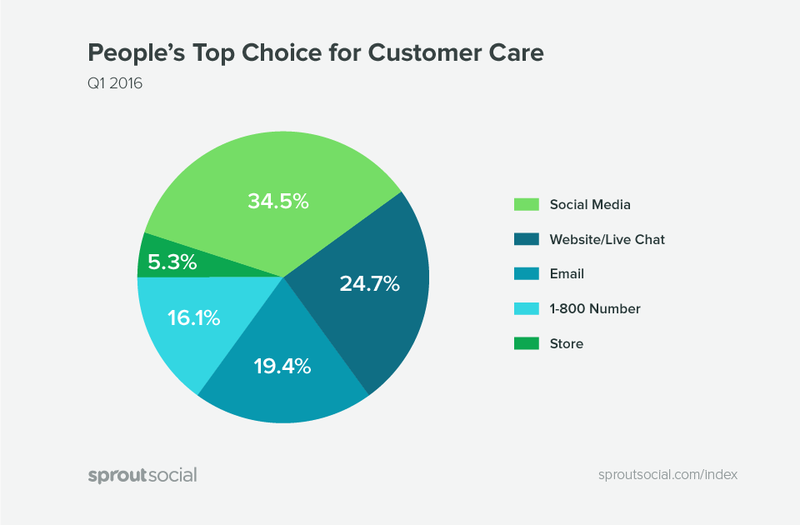 According to the Sprout Social 2016 Q2 Index, nearly 35% of customers chose social media for customer care. That percentage outranks live chat, email, 1-800 numbers and in-store assistance. People are continuing to use social media as their contact reference for brands. And for your business, you need to be supportive and communicative on Instagram. Try to respond to as many questions or comments as possible, because it could mean the difference between getting a new customer, follower or improving your relationship with your audience. In fact, our Q1 2017 Index discovered 71% of users are more likely to make a purchase after a positive social interaction. The more conversation grows around your feed, the more likely you’ll gain followers. Appreciate your followers and don’t be afraid to reply. If you truly want to get more Instagram followers, you have to provide something of value. Whether it’s through great visual content, insight on new deals or showcasing users on a brand account, you have to be somewhat valuable to your followers. And one way brands are getting users to participate and follow is through user-generated content. For example, Hilton Hotels does a wonderful job of promoting user-generated content on its Instagram account. This type of user promotion can spark more people to send content, use your branded hashtag and get shared across multiple accounts. That type of exposure is exactly what leads to your brand getting more Instagram followers. The trust and fun experience you create will help help garner future relationships and possibly form some brand advocates on the way. One of the most tried-and-true ways to get followers on Instagram is through hashtags. For years hashtags have allowed us to extend our social reach. As a marketer, you want to build your community by gaining followers and hashtags provide just that. For starters, find hashtags that are not too populated. Social Media Examiner points this theory out by explaining how the hashtag #love has more than 184 million photos connected to it. Trying to highlight your Instagram content in a sea of millions of pictures and videos is not an easy thing to do. You have to find hashtags that people in your target audience are more likely to check. If a relevant connection is made, these users will be more likely to follow your account. For example, M&Ms does a great job at localizing hashtags to an event where they are participating. By using hashtags like #mmspotlight, the brand targets its audience more directly where the spotlight concert event happens and creates awareness. 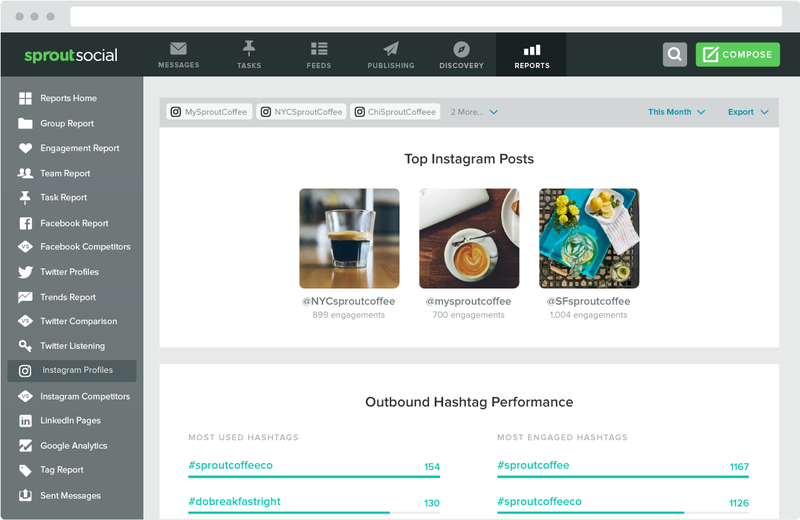 Understanding how your hashtags perform on Instagram is also just as critical to using them. 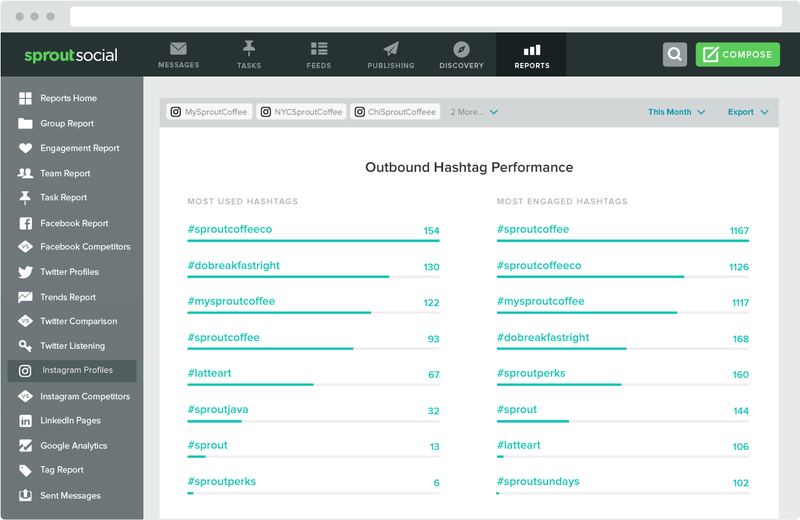 And with Sprout Social’s hashtag analytics tools, you have direct access to hashtag performance and usage data to see what’s working best. Don’t go blindly into the hashtag universe, know what you’re tagging so you can build your following. Last but not least, when you make your Instagram followers happy, you see the payoff in audience growth. Following the previous tips is going to help you make your Instagram followers happy. So the last thing you want to do is seem needy, sales-driven or robotic. Try managing your Instagram with good intentions and provide content to your followers as if they were your friends on your personal feed. Instagram is only growing so taking advantage of these tips to get followers will help you increase your reach. Build great audiences and get more eyes on your content because social media can be a very powerful marketing driver. Do you have any tips on how to get Instagram followers? Let us know if the comments!